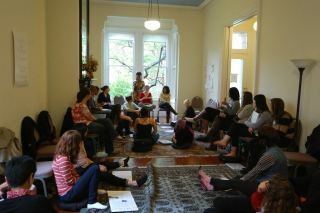 How Can we Use technology to Build the Full Spectrum Doula Movement? Entrance through the scarf shop and look for yellow awning that reads "Yummy Bites"
A discussion and skill share about how doulas are using communication technologies to build their businesses and better serve their communities. Join us to learn hands-on technology tricks and tips while together envisioning how we can use technology to better serve our communities! We'll touch on how doulas are building their bushiness, their community organizations, and their movement while supporting communication with the people and families they serve. Light refreshments will be served. Gwendolyn Roberts is a full-spectrum doula and member of (Re)Birthing Collective and the Bay Area Doula Project. As a doula she makes use of user-friendly apps and sites to promote her business and to stay in touch with clients. She's also a part-time nanny, painter, poet and yoga teacher in training. She will be presenting on how she uses social media and internet technology to build and maintain her small business. You can can find her online (Re)Brirthing presence at rebirthingcollective.org and on Facebook. Nicole Sata is co-founder of the Birth Justice Project whose volunteer doulas serve pregnant women who are incarcerated or in drug recovery. She firmly believes that all women deserve to have peaceful and transformative birth experiences. As a doula community organizer, she makes use of a wide range of free software and applications to help organize the Birth Justice Project and is excited about sharing the tools she uses with the BADP community. Tatiana Josephy is the Co-Founder and CEO of MobileCurious, an app development company with a focus on women's health. MobileCurious has launched Hormone Horoscope for iPhone and TrueCycle for web, with over 40,000 happy users. Born and raised in Canada, Tatiana graduated from Princeton with a focus on public health. Tatiana ran marketing and UX for Donors Choose in NY and also leads platform development at CrowdFlower in SF. Follow her on Twitter at @tatianajosephy.